All of my earnings will be donated to the Bryn Mawr Film Institute. It is a mystery for movie lovers, like its prequel, Out of the Picture. The new story deals with the double sexual standard and sexual abuse of women. I don't know if this 1972 film is the greatest American motion picture, but it is my favorite, so please excuse the length of this article. Being Italian American, I appreciate how Francis Ford Coppola captured with so much detail and, appropriately, flavor the ethnic culture in which I grew up. The world he presents to us in this movie is one of contrasts, and those contrasts create a great deal of irony in the way the individuals, and by extrapolation, American society, functions. (And, if I may, a theme I tried to explore in my novel, Feast or Famine). The film sets up the analogy to the United States as a whole in the first words we hear uttered by the funeral director, Bonasera (Salvatore Corsitto) in his plea to Don Vito Corleone (Marlon Brando) for revenge for the assault on his daughter. He says, “I believe in America.” He is asking for what he considers justice from a powerful enforcer, just as an American citizen would ask the country’s legal system for punishment of a wrongdoer. But, Bonasera did not get his justice, because the so-called legitimate, overt system of jurisprudence has become a compromised disappointment, and his daughter’s attackers were set free by the issuance of a “suspended sentence,” an action which is not consummated. When he says he believes in America, he utters what most citizens feel, faith in a country of ideals. But, unfortunately, it is a land which falls short of those principles in practice many times. So, he seeks satisfaction in an alternate way, from his tribe, those with blood ties to himself. How many of us would like to seek a way around a nonresponsive system by way of vigilante justice? The contrast between the bright surface reality and the dark underbelly of society is demonstrated many times in the setting, characters, and action of this film. 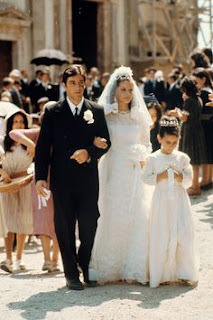 The opening scene of the wedding of Vito’s daughter, Connie (Talia Shire), on the Corleone estate is shot in the bright light of day, and has friends and family laughing, eating, and dancing in a joyful celebration. But, Coppola counters the shots of the happy occasion by cutting to The Don’s office, photographed in shadows, where The Godfather agrees to carry out unlawful activities because he must not deny requests on the day his daughter marries. He perverts a well-meaning cultural tradition by agreeing to physically harm Bonasera’s daughter’s attempted rapists. Bonasera wants the men involved in the assault killed. Vito lectures him by saying that is not justice, in the Biblical sense of an eye for an eye, because his daughter still lives. This statement makes The Don appear to be a person who understands fairness, but this outward appearance is undermined by his act of agreeing to take the law into his own hands. 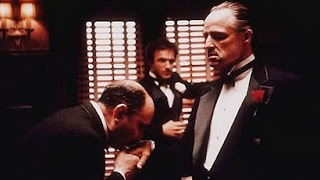 According to The Annotated Godfather, which contains the complete screenplay with background information, by Jenny M. Jones (Black Dog and Leventhal Publishers, Inc, 2007), Coppola would communicate nonverbally with Brando, sometimes providing the actor with props. He placed the cat in the opening scenes in Brando’s lap. The playfulness between The Don and the kitten becomes symbolic. Vito Corleone on the surface appears to be a gentle senior citizen, but, just like the cuddly cat who has hidden claws and sharp teeth, The Don is really a predator. The cinematographer, Gordon Willis, known as “The Prince of Darkness,” made sure the lighting in the scenes left Brando’s eyes in shadows, producing a sinister look. Coppola also stresses the duality of other characters by showing the crime boss Barzini (Richard Conte) enjoying being a guest at the wedding, but also depicting him ripping film out of a camera from a photographer taking Barzini’s picture. This coupling of decorum and brutality is echoed when Sonny (James Caan) smashes the camera of a man taking pictures of cars parked at the wedding site, and then throws money at him to pay for the damage. He says that the “Goddamn FBI, don’t respect nothing,” a statement which turns the usual perception on its head, making it look as if the legitimate law enforcers are the bad guys, disrespecting the gangsters at a happy private family occasion. 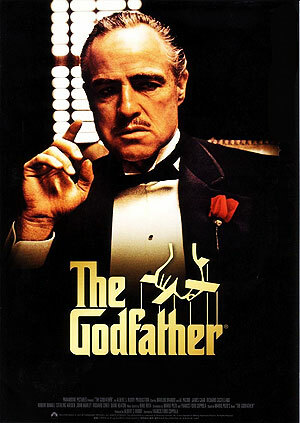 Coppola emphasizes the disparity between the benign and malevolent aspects of the characters and their backgrounds by showing the way love of the family and cultural traditions contrasts with aggressive behavior against those they view as being in opposition to familial and business interests. 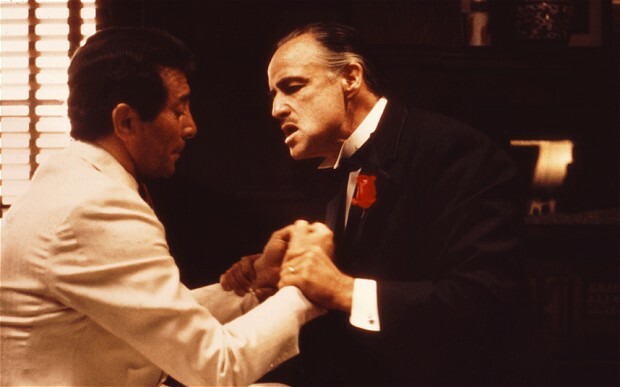 In the same opening scenes in The Godfather’s office, we have The Don requiring respect and friendship from Bonasera, since Vito’s wife is godmother to the funeral director’s daughter, before complying with Bonasera’s violent request. Later, Vito at one moment seems serene, and then violently yells at singer Johnny Fontane (Al Martino), telling him “You can act like a man!” when the celebrity appears weak. The Don then lectures his philandering son, Sonny, indirectly, about how a man is not a real man unless he spends time with his family. 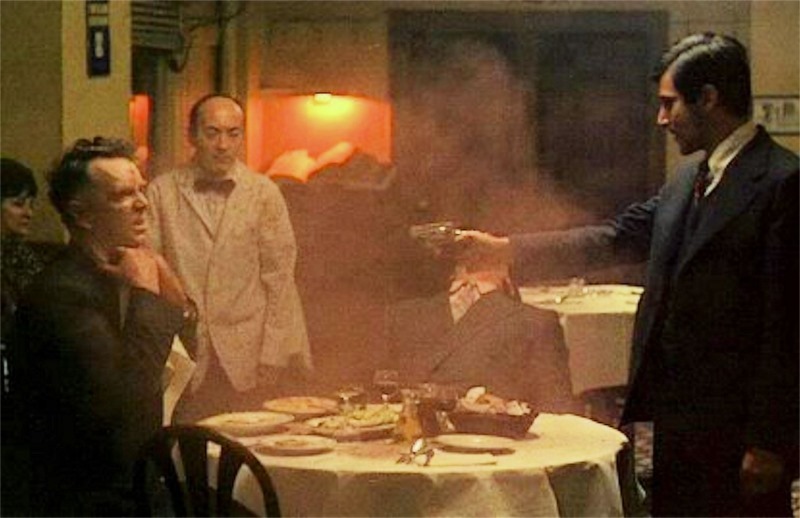 He makes this upstanding point, ironically, just before telling Fontane that he will use violent intimidation to get the singer a film role by making the movie producer “an offer he can’t refuse.” (The infamous decapitated horse’s head scene which persuades film producer Woltz (John Marley) to give Fontane the part is symbolically a castration message sent to the movie mogul, since Woltz boasted about his sexual conquests, and the horse was scheduled to be put out to stud. In addition, the horse is a beautiful creature which is desecrated by the ugliness of the Corleone brutality. And, as Jones mentions in her book, the name of the horse, Khartoum, refers to a British commander of the city of that name who was decapitated by rebels when he tried to evacuate Egyptian forces from the area in 1885). A couple of the best scenes that emphasize the irony in this contrast between the Italian American affection for the domestic and the propensity for violence involve Pete Clemenza (Richard Castellano), one of the high ranking men in the Corleone organization. He utters the famous line, “Leave the gun. Take the cannoli,” right after the shooting of Paulie (John Martino) who betrayed The Don. This line and the subsequent scene where he shows Vito’s son Michael Corleone (Al Pacino) how to prepare a meal for a large group perfectly show the marriage between the bringing together of loved ones with food, but how that sentiment is undermined by violence. During the dinner preparation scene, Clemenza is not making a meal for family members but instead for gangster soldiers. And, after stirring in his sausage and meatballs into his sauce, he informs Sonny that he won’t be seeing Paulie anymore. (When backing out of the driveway, on the way to killing Paulie, Clemenza warns the future victim to watch out for the kids. 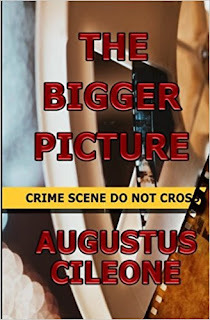 The killer is also a family man, worrying about children, which again shows the dual nature of the Italian American gangster world, and, by extrapolation American society. Coppola uses the innocent image of children in other scenes to contrast the two aspects of this culture: children run into The Don’s study while the hitman Brasi is there; Michael and his father plot against Barzini while talking about Michael’s son reading the “funny papers;” Michael reunites with Kay, desiring marriage and offspring, amid a group of children, appearing like a dark snake in a suburban Garden of Eden). Coppola heightens the evil underlying society by inserting violence and fear against settings of benevolence. Gruesome and threatening action occurs at Christmas time, when there is supposed to be peace on earth. 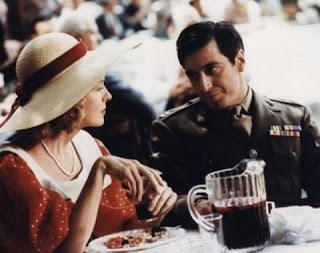 Michael and his girlfriend Kay (Diane Keaton) carry Christmas gifts just before the audience watches scary Corleone thug Luca Brasi (Lenny Montana) stabbed and garroted, and The Don peacefully buys some fruit from a vendor on a New York City street when thugs sent by Sollozzo (Al Lettieri) shoot him. (There is a quick foreshadowing of Brasi’s fate when he enters the club where he is killed: the glass doors of the establishment, a place where one enjoys life by eating seafood, has fishes swimming on it, linking the image to the later scene of fish in Brasi’s bullet-proof vest, and the line that he “sleeps with the fishes.” Also, the kissing of The Godfather’s hand, a sign of almost religious devotion, the way a Pope’s ring is kissed, can lead that loyalty here to death, symbolized by Sollozzo’s driving a knife into Brasi’s hand in a demonic version of crucifixion). Corleone family attorney Tom Hagen (Robert Duvall) carries a child’s sled (a reference to Citizen Kane? ), presumably a holiday gift for his child, when Sollozzo kidnaps him, interrupting his happy seasonal gift shopping, so he can negotiate business involving drugs with the Corleone family. While he enters Sollozzo’s car we see a dancing Santa in a store window, again providing an ironic contrast. Michael and Kay come out of a movie theater, after enjoying an escape into the joy of a holiday film (as we would try to do when we go to the movies? ), and have their tranquility torn away when they see the newspaper headline informing them of the shooting of Michael’s father. Michael goes to visit his wounded father at the hospital, a place where we expect healing and protection. However, in this world, the medical facility seems all but abandoned except for one nurse, and Michael must use his wits to defend his father against criminals and the compromised police, who instead of shielding a citizen against harm, even though he is a gangster, are more dangerous threats since they pretend to be protectors. Michael is the real main character in this tale, and it is through his story that we see the decline of idealism and the submergence into the dark side of the human soul. When we first encounter him, he is clothed in legitimacy in his military uniform at the wedding, a war hero. After relenting to Kay’s questions about the monster-like Luca Brasi, he relates the horrifying story of how his father, accompanied by Brasi, assured a band leader that his signature or his brains would be on the contract releasing Fontane. He then says to her, “That’s my family Kay; it’s not me.” No more ironic words have ever been spoken in film history. After he sees his father looking defenseless in the hospital bed he says to The Don, “I’ll take care of you now. I’m with you now. I’m with you.” It is at this moment that Michael reverses his path away from his family and returns to its embrace. Blood is definitely the thicker liquid. When he is outside in front of the hospital, pretending to be a bodyguard as an ominous car rolls by, waiting for men to come and guard his father, he looks at his own hands holding a cigarette lighter. The hands are rock steady. At that moment, in this context, Michael realizes he can be cold-blooded, and he is his father’s son. We see Michael holding the lighter in his hands in scenes in the final third of the film, which reminds him, and us, of how dispassionate he can be. That is why the soldier, who killed defending his country in war, can now kill Sollozzo and the corrupt Captain McCluskey (Sterling Hayden), another example of the inauthenticity of appearances, for his family at war on U. S. soil between competing business factions. After McCloskey breaks his jaw, a wound sustained in this new war, Pacino’s face swells, and he takes on some of his father's jowly appearance, and of Brasi’s, becoming more grotesque, revealing on the outside his uglier inner nature. Where does he murder his enemies? – in a seemingly sedate, safe family restaurant. Again, the setting, where food is served, a place which is supposed to sustain life, is the place where life violently ends. Michael’s escape to Sicily is necessary until the family can manipulate the political system and have him return to America. But, it is also a symbolic interlude in the story. Michael returns to his Italian roots, and his marriage to the Sicilian Apollonia (Simonetta Stefanelli) is also indicative of Michael joining with his Italian heritage. The beautiful land that we see has its negative connotations. In the town of Corleone Michael asks where are all the men, and he is told they are all dead from vendettas. The island’s inherent violence stands side by side with its surface beauty and family traditions. Visually, Coppola makes this point when he has Michael and Apollonia walking seemingly safe alone on a back road. But, then we see the people from her village following them like chaperones. After that, Michael’s bodyguards take up the rear of this Italian procession, their guns strapped over their shoulders. One of these men, Calo (Franco Citti), tells Michael that in Sicily, “women are more dangerous than shotguns.” So, underneath Apollonia’s outward beauty, just like the country she comes from, resides the threat of danger. Michael cannot escape that threat, and he has to be moved for protection, but treachery is everywhere. Fabrizio (Angelo Infanti), supposedly one of his bodyguards, betrays Michael, and puts a bomb in his car. But, Apollonia wants to drive the car, and is blown up, thus welding the contrasting aspects of love of family and culture with violence in one image. When Michael returns to America, he brings this duality with him. He wants to be a family man, and he succeeds. He marries Kay and they have children. 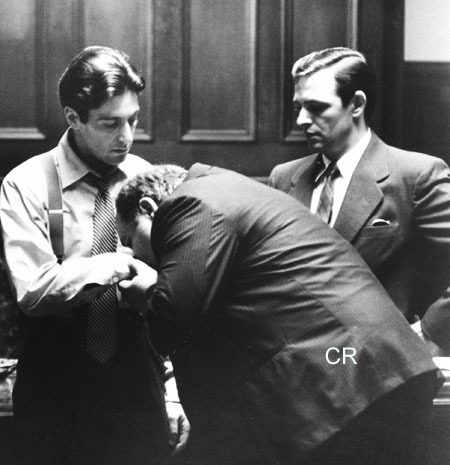 But, he now is the head of the criminal Corleone family, with his ailing father his counselor. When he goes to Las Vegas, he rejects the party girls offered to him by his brother Fredo (John Cazale), respecting his marriage to Kay. He must honor the pledge made by his father that there will be no breaking of the peace between the five gangster families in New York while The Don still lives. 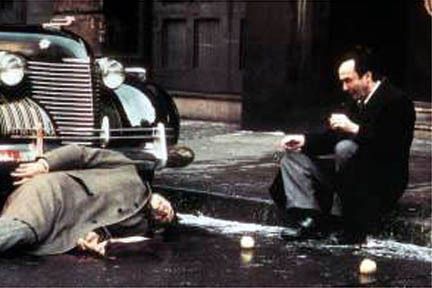 But then Vito dies, again in a very ironic scene. He is in his garden (references to Eden? ), with his innocent young grandchild. Vito appears as a playful, doting grandfather. But what kind of game does he play? He puts an orange peel in his mouth, grunts like a monster, and scares the child, causing him to cry. Again, we see how his love of family and his threatening nature live side by side inside the man. After Vito dies, Michael carries out the executions of the heads of the family’s rivals in one of the most powerfully ironic pieces of film editing in motion picture history. The camera cuts back and forth as Michael renounces Satan, standing as the godfather for Connie’s baby (the infant Sofia Coppola playing the part) in church during the administering of the Catholic sacrament of baptism, and we see the murders he has ordered. The holy actions of the priest are placed in counterpoint to the killers going through their rituals of assembling their weapons and preparing for their deadly activities. There is irony within irony here, as Clemenza hides his lethal rifle inside a flower box. We again see the evil hiding underneath a benign exterior, as is the case with the lives of these people. The hit-man Neri (Richard Bright) dresses as a police officer, a symbol of law and justice, to get close to Barzini’s car, and then guns him down on the steps of what is actually the New York County Supreme Court building in Manhattan. The very symbols of what we call civilization turn out to be phony facades, like fake buildings on a movie back-lot. Even worse, they are propped up on a foundation of corruption and violence. In the scene where Paulie is shot in the car, the camera films the killing at a distance. In the upper left hand section of the screen is The Statue of Liberty. The shot recalls Bonasera’s believing in the idea of what America stands for. But the statue is way in the distance, implying that the ideals of the United States are receding into the background, and the unjust acts are now in the foreground. When Michael learns about the shooting of his father, he goes to a phone booth to contact Sonny. But, he shuts the booth’s door on Kay, cutting her off from knowing what is actually going on. When The Don comes home from the hospital, his subordinates close the door of his bedroom, isolating their mobster discussion from the family members preparing food to celebrate his return. The movie ends with Michael in his office as he accepts his ascension to power as the new Don Corleone. Neri closes the door on Kay, showing how the evil part of Michael creates a divide, cutting him off from the love of family that his father, and his heritage, supposedly cherished. In essence, he is shutting the door on the redeeming hope that America represents. The next movie is Inherit the Wind.